Ronald Wilson Reagan was born in Tampico, Illinois on February 6, 1911. His father, Jack, was a failed businessman and alcoholic; his mother, Nelle, a charitable and religious woman. The family moved frequently before settling in Dixon, a small midwestern town which Reagan later idealized as "a place were life was wholesome…people trusted each other, and nobody locked his door at night." As a teenager Reagan spent summers working as a lifeguard at the local beach on the Rock River, where in 7 years he saved 77 lives. Reagan clung to this image of himself as a hero throughout his life. The Rock River, said Reagan biographer Edmund Morris, was "the central symbol of his youth." Reagan did not distinguish himself academically during his four years at Eureka College, but he was successful as both a football player and as an actor in school plays. He graduated in 1932, during the Depression. After six weeks, the man who would become known as the "Great Communicator" was hired by an Iowa radio station as a sportscaster. In 1937 Ronald Reagan went to Hollywood. Under contract to Warner Brothers, he was repeatedly cast as himself, or a very close facsimile. In his first role in Love Is on the Air he played a radio announcer. His roles called for him to be wholesome and Midwestern and often, a hero. After years as a "B" actor, Reagan gained recognition for his role as football hero George Gipp in Knute Rockne, All American and Drake McHugh in Kings Row. 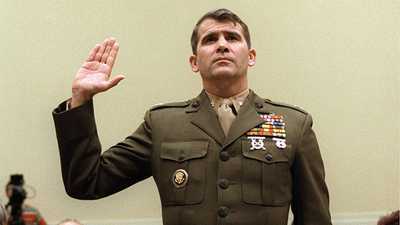 One of his most successful roles was as Ronald Reagan himself. Reagan and Jane Wyman, married in 1940, starred in Hollywood's quest to cultivate an image of innocence. Soon after America entered the war, Reagan left Wyman and baby daughter Maureen (Michael was adopted in 1946) in Los Angeles to serve in the Army Air Force Motion Picture Unit in Culver City, 19 miles away. Here Captain Reagan starred in training and inspirational films filled with uplifting stories. Forty years later, he would lead America much the same way. Reagan "returned" to Hollywood at war's end and became active in the Screen Actors Guild. He was SAG president for five consecutive terms, from 1947-1952, and again from 1959-1960. Reagan testified before the House Committee on Un-American Activities in 1946 during the ongoing Red Scare in Hollywood; though he was a "friendly" witness, he refused to name names. It was from his experience battling alleged Communist penetration of SAG that Reagan developed the anti-Communist beliefs which remained at the core of his convictions through his presidency. After the war, Reagan’s movie career and marriage foundered. In 1949 Reagan and Wyman divorced. He remarried in 1952. Reagan and actress Nancy Davis had two children, Patti and Ron, and undoubtedly one of Hollywood's most successful marriages. As adults, Patti and Ron would reveal that their parents' devotion to each other was in stark contrast to their emotional remoteness from their children. In 1952 Reagan became the host of General Electric's G.E. Theater. In his new role as company spokesman, on factory stops around the country, the registered Democrat was becoming a recognized conservative spokesman. In 1962 he officially changed his party and in 1964, gained national recognition, when he spoke on behalf of conservative republican presidential candidate Barry Goldwater in a stunning national debut. Reagan entered the California gubernatorial race in 1966. Asked during his campaign what kind of a governor he would be, Reagan joked, "I don't know; I've never played a governor." Promising to cut property taxes, reduce government waste, and curb student unrest on California's campuses, particularly Berkeley, Reagan was elected and reelected governor of California. During his second term, he succeeded in building consensus around his Welfare Reform Bill. The bill, approved by the California State Assembly, reduced California’s growing welfare roles and embodied "some of the key themes of Reagan’s conservative philosophy." Some of Reagan’s actions as governor would seem surprising from the perspective of the conservative agenda of his presidency. Governor Reagan signed a permissive abortion bill. Although he viewed homosexuality as "an abomination" on religious grounds, he was reluctant to make pronouncements against individuals. Later, in 1978, he spoke out against California's Briggs proposition, which would prohibit homosexuals from classroom teaching. The proposition was defeated. In 1980 Reagan was elected president on a platform that called for "a new consensus with all those across the land who share a community of values embodied in these words: family, work, neighborhood, peace and freedom." He promised to fight Communism, reduce the role of government in the economy, and restore the nation’s confidence in itself. As he rallied the nation behind his agenda, he borrowed a line from Knute Rockne and asked Americans to "win one for the Gipper." On March 30, 1981, John Hinckley Jr. attempted to assassinate Reagan. The mentally ill Hinckley harbored an obsession for actress Jodie Foster and saw the assassination as a way to attract her attention. The nation was captivated by reports of Reagan's resilience. Near death (though the public didn't know it), with a bullet in his lung that had missed his heart by only an inch, he told Nancy, "Honey, I forgot to duck." Reagan was known as the "Teflon president," his popularity impervious to his performance. But the Teflon did not always hold. During the 1982 recession, Reagan's optimism lost its appeal, particularly for the nine million Americans who were unemployed by November. His approval rating plummeted to 35 percent. 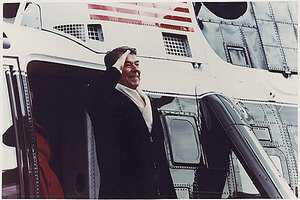 Only a resurgent economy in 1983 restored Reagan's popularity. Likewise during the Iran-Contra Scandal, only 14 percent of Americans believed the president when he said he had not traded arms for hostages. Reagan professed to hate nuclear weapons, yet he truly believed that America should be armed to the teeth for a war that must never be fought. At the height of the military build up the Pentagon was spending $34 billion per hour on armaments. He capped his defense program by announcing the Strategic Defense Initiative (SDI). The program was derided by many an opponent as "Star Wars," something out of Science fiction, but Reagan firmly believed a space defense system could shield America from the threat of nuclear annihilation. Reagan's crusade against communism led him to support anti-communist insurgencies worldwide: Solidarity in Poland; the Muhajaddin in Afghanistan; the Contras in Nicaragua. This crusade also led to the invasion of Grenada, in 1983, and to the scandal which came to be known as Iran-Contra. Iran-Contra ushered in the darkest period in the Reagan presidency. Beginning in 1985, the Reagan administration sold weapons to Iran in exchange for hostages in violation of the law and Reagan’s promise not to deal with terrorists repeatedly. Although Reagan claimed he had not traded arms for hostages held in Lebanon by order of Iran's Ayatollah Khomeini, the country did not believe him. The scandal deepened when it was found that funds from the sales were diverted to the Contras in Nicaragua in violation of the Boland Amendment. There was talk of impeachment. Investigators could never link Reagan directly to the diversion of funds, but his credibility was damaged, as the nation became aware of his distance from the workings of his own White House. In the end, most Americans forgave Reagan for Iran-Contra, and his popularity once again soared in the wake of his Summit meetings with Mikhail Gorbachev. Reagan left office with record-low unemployment and a booming economy; the budget deficits, which engulfed government in his wake, were obscured by the optimism of the Reagan era. To date, his supporters credit his military build-up and personal determination with the end of Communism, sometimes at the expense of acknowledging the contribution of Gorbachev. Reagan himself called the end of the Cold War a "triumph of democracy." The bloom in terms of public opinion has not yet left President Reagan's rose. After he revealed in 1994 that he'd been diagnosed with Alzheimer's, concerns mounted that the disease had actually taken hold in office; his ability to concentrate and grasp facts had been debated more than once. It didn't matter. Whether on the silver screen or the political stage, Reagan was durable, optimistic, American. In 1989, after two terms in office, Ronald Reagan delivered this farewell speech.